A good friend mentioned in passing the other day that opensolaris.org would finally be decommissioned tomorrow. I could not help but reflect on how much things have changed since Friday the 13th. Since that time, my work with Solaris has ceased almost entirely. Professionally (and personally) I've moved on to other areas of interest, though OpenSolaris remains a fond memory. The community's response still astonishes and humbles me - 50,000 page views was far more than I ever expected. In a somewhat bizarre twist of fate, Erin and I relocated to the Bay Area a couple of months after our daughter, Elizabeth was born. We settled a few blocks away from the old Sun headquarters in Santa Clara. The Coraid offices are also quite literally in the shadow of the Oracle campus in Redwood Shores. I still chuckle at the irony of it all. I will forever be grateful for the opportunities the OpenSolaris project has provided for my family and me. For a too brief moment in time, I was able to work shoulder-to-shoulder with some of the most brilliant engineers in our field (and had a hell of a lot of fun doing it). You know who you are. Thank you. A couple of weeks ago, Erin, Elizabeth, and I were walking home from the park when something caught my eye. It was a discarded Solaris 11 Live CD lying by the side of the road. I simply cannot think of a more fitting way to end this post. running ssh anonhg@hg.illumos.org "hg -R illumos-gate serve --stdio"
The final webrev can be found here. I spend over 90% of my time sitting in an editor. Having switched to a dark-on-light terminal scheme years ago I could never find a color scheme in which I could be productive using a light background, so I stuck with my ancient light-on-dark color scheme for console editing. The effect is actually quite jarring; I use a number of terminal sessions during the day for any number of tasks (including editing). Perhaps it's simply a sign of getting older, but I've found that switching rapidly between sessions can not only cause eyestrain, it also wastes time waiting for my eyes to adjust to a radically different background. I created a simple color scheme that works well with dark-on-light displays. I drew some inspiration from the google color scheme (notably the use of underlining for language keywords). Rather than saturate the screen with color, I opted for a simpler scheme using a grayscale pallete with bolding and underlining for emphasis. This scheme should work equally well on both color and GUI terminals. The color scheme can be found here. Simply download and place under $HOME/.vim/colors/. You can select the scheme by issuing: :colorscheme newsprint once in Vim. Overall, I'm pleased with the result. Moving between sessions is a smoother and faster experience. While this scheme probably isn't suitable for long-term editing, it's certainly better for quick edits made from the console. "Who forgot to pay the water bill?" What follows is an email sent internally to Oracle Solaris Engineers which describes Oracle's true intentions toward the OpenSolaris project and the future of Oracle Solaris. This concludes over four years that I (and many other external contributors) have worked on the OpenSolaris project. This is a terrible sendoff for countless hours of work - for quality software which will now ship as an Oracle product that we (the original authors) can no longer obtain on an unrestricted basis. I can only maintain that the software we worked on was for the betterment of all, not for any one company's bottom line. This is truly a perversion of the open source spirit. that we will achieve through proper design and engineering. such as the one with Intel, are examples of valued participation. As noted previously, I took a job working with Coraid, Inc. back in May. My family and I have finally completed relocating down to beautiful Athens, GA. We are all very excited to be part of the culture here and are looking forward to many happy years. spwr(7D) is dead. Long live efe(7D)! PSARC 2010/168 (EOF spwr) will officially remove support for SMC EtherPower II fast ethernet controllers from ON. Fortunately, the Emancipation project provides an alternative for users whom still require support for these devices. 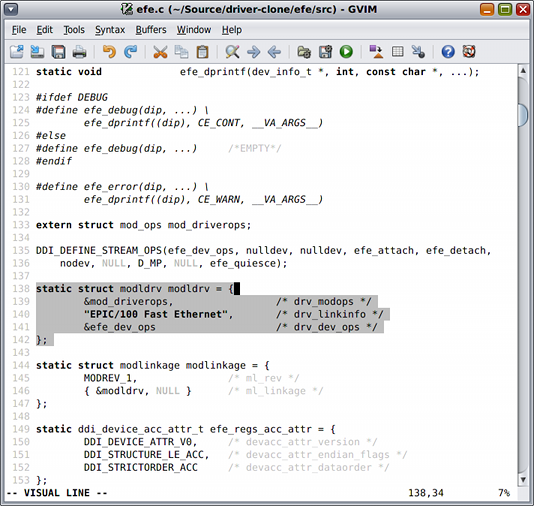 The efe(7D) driver is a open source rewrite of the previously closed spwr(7D) driver. It supports both GLDv3 and Project Brussels interfaces and supports full 802.1Q VLANs and link aggregation. The driver supports both SPARC and x86. The current version of the driver requires at least snv_134. Once the 2010.0x release ships and development builds resume, a new driver release will be made to support the committed GLDv3 interfaces putback in snv_136 and IPS. About a month ago I accepted a position at Coraid, Inc. as a Solaris kernel developer. My primary focus will be driver development for the company's AoE-based storage HBAs and other related hardware. After saying my goodbyes in St. Louis last week, I drove down to Athens, GA for two weeks of orientation and team building. I have to say, this last week at Coraid has been a gas - the engineering team here is astounding and leadership goes a long way toward making this a friendly and productive environment in which to work. Everyone here seems pretty keen on what Solaris/OpenSolaris has to offer (particularly with respect to storage) - I am definitely looking forward to the road ahead. The source for the service manifest and method script is available here. These files should be copied to /var/svc/manifest/application/virtualbox/ and /lib/svc/method/, respectively. The vbox/start_type property corresponds to the --type argument passed to VBoxManage startvm; by default, it is set to headless. Possible values are: gui, sdl, vrdp, and headless, however only the last two really make any sense when used with SMF. svc:/application/virtualbox/headless:qnx641> setprop vbox/stop_method = astring: "poweroff"
Since this is a "wait" model service, it does not properly support a user shutting down the guest outside of svcadm(1M) invocations; the service will continue to report its status as online. 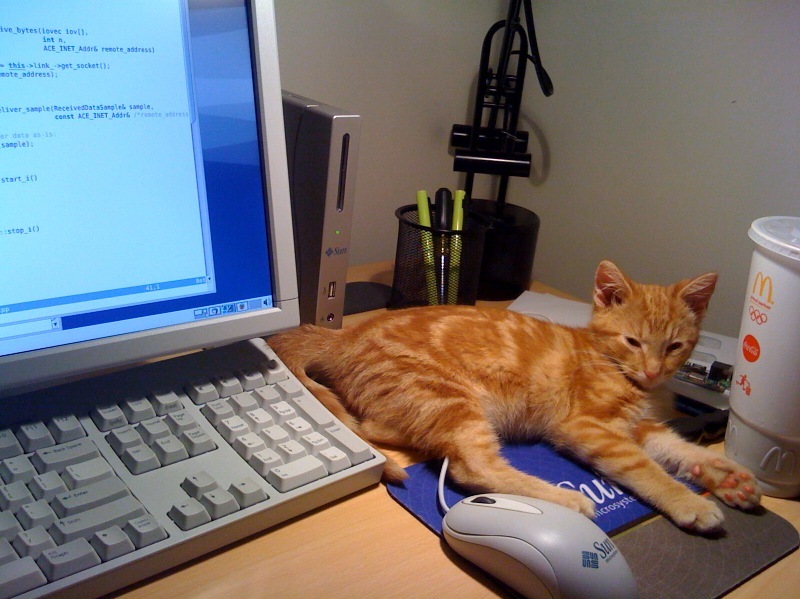 In this case, a simple disable or restart will resolve the problem. Copyright © Iconoclastic Tendencies. All rights reserved.